Into the countryside that offers a close look at rustic village life-skiff-fishermen launching their cockleshell boats, large flocks of domesticated ducks waddling down to the water from thatched houses on the banks, aimless cattle grazing in fertile pastures, lotuses floating here and there in small shallow ponds, canals or waterways vary in dimension from being wide enough to be dubbed lakes, lush green rice fields thinning out into the distance and coconut groves with the occasional temple or church, ostensibly rich with marine bounty all around the snaky silvers of freshwater or simply soaking up the sun !!! an exclusively new experience beckons you. 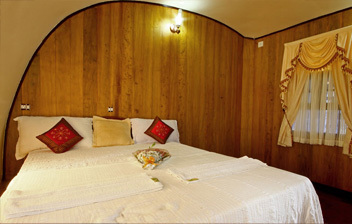 If it is overall comfort and pampering that you are after, then "Super Luxury" is definitely the boat for you. 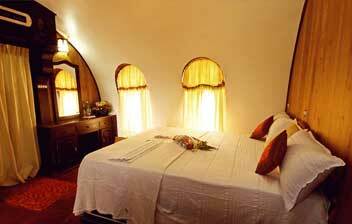 Airy living rooms, elegant staircases leading to an upper deck with dining room, full time air-conditioned gorgeous bedrooms with bathtub and standing shower. 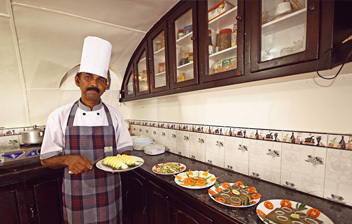 A multi-linguistic personalized Butler to attend to your diminutive requirement and serve you the bountiful food to suit your frame of mind on the back waters. 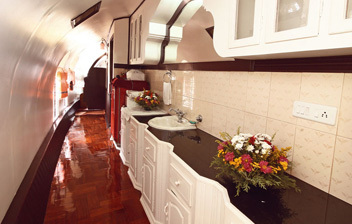 This Houseboat is nothing short of sheer and absolute luxury of the highest available echelon. 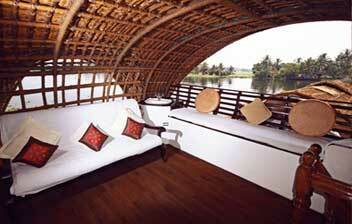 This package also includes the choice of a short ride on the canoe through the narrow canals on the backwaters. The Kettuvallams or 'boat with knots'- was so called because the entire boat was held together with coir knots only - not even a single nail is used during the construction. 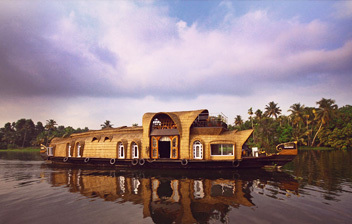 Houseboats or Kettuvallams were large barges used to carry goods .The original Kettuvallams were used to carry tones of rice and spices - standard Kettuvallam could hold up to 30 tones. Today, these goods carriers have been adapted to make the most exciting tourism product in India without losing its originality. 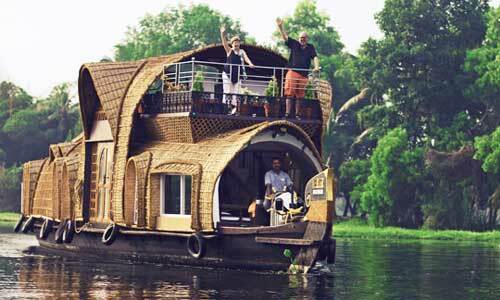 While converting Kettuvallams into houseboats, care is taken to use only natural products. They are on average 70 feet long boats with 15 feet width in the middle portion . The wood commonly used to make Kettuvallams is 'Anjili'(a kind tree belonging to the jack fruit family), which is found in abundance in central Travancore area. Large planks are tied together using handmade coir ropes and beaten coconut fibers. This is then coated with a caustic black resin made from boiled cashew kernels. This gives the Kettuvallams enough strength to withstand heavy waves in the sea. Bamboo mats, sticks and wood of the aracanut tree are used for roofing, coir mats and wooden planks for the flooring and wood of coconut trees and coir for beds. Solar panels are used for lighting. These long cargo boats are a familiar sight on the backwaters. With careful maintenance, a Kettuvallam can last for generations. These boats cruised forward from near- extinction to enjoy their present great popularity. Lakelands has a large range of House boats to choose from. All these boats are more individual in nature; they vary in space, size, shape, facilities and packages. They have carefully categorized them accordingly…….just depends on how you want it.